We're now on day 151 (it's true, I checked) of trying to definitively figure out who Rey's parents are, and the theories are continuing to pile up. One of the more interesting analyses currently making the rounds is that John Williams - who has provided the musical score for all of Star Wars' cinematic episodes - deliberately put musical callbacks to his popular Darth Vader themes in Rey's theme for The Force Awakens. But does the legendary composer even know who Rey's parents are? 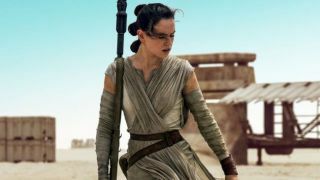 During a performance with the Boston Pops Orchestra (via Indie Revolver), Williams told the audience in attendance his thoughts on Rey's parentage; "I never asked J.J. Abrams who Rey’s father is, but I think it’s Luke Skywalker. Your guess is as good as mine, though". Directed by JJ Abrams and starring Harrison Ford, Carrie Fisher, John Boyega, Daisy Ridley, and Adam Driver, Star Wars: The Force Awakens is available on DVD & Blu-Ray now.